More losses were on tap for precious metals overnight with gold prices touching lows near $1,315.00 and silver falling to a $22.82 low before some rebounds were noted in the pair. As things stand at the moment, gold is headed for its worst (and first in six) weekly drop (of nearly $70) since July on based profit-taking engendered by little more than pre-Seoul nervousness and more, early second-guessing, ahead of the Fed meeting in early November. Or, is it? HIghMark Capital’s CIO David Goerz sees an asset that has outperformed equities over the past decade but has recently turned into a deflation hedge and is moving in concert with them. Neither he nor Marketwatch’s Mark Hulbert see gold and stocks continuing their close tango, and the latter actually posits the idea that bullion and equities may just (this week) have finally de-coupled. Mr. Hulbert added that the pair might return to their ‘old ways’ – that is, a low correlation environment in which stock do well (or certainly better than they have during this ‘lost decade’) and gold serves as a diversifier of risk but does not glitter quite to the extent that it has, up to this point. No such visions over at Barclays Capital, whose managing director offered a target of $1,850.00 for the yellow metal, before the end of 2011 rolls around. The firm had –not that long ago- opined that gold might be headed toward roughly the same number, but without the digit 1 in front and not followed by a comma. Okay, then. Spot gold bullion opened the final session of the week manifesting some leftover selling pressure and was down $7.40 per ounce at $1,318.30 on the bid side. Most of these losses were recouped within the first half-hour of trading as pre-weekend book-squaring started to make its presence felt and as the US dollar slipped to 77.39 on the index amid more uncertainty about currency imbalances (and what to do about the) originating from statements made by various G-20 participants in Seoul. The relatively stormy Seoul meeting is apparently not offering much in the way of early signs of success to Mr. Geithner’s proposal that various nations limit trade surpluses and/or deficits to a percentage of their respective outputs. Russian (!) delegates dismissed the idea as smacking of a “planned economy�? line of thinking. Meanwhile, silver dropped 19 cents at the start of Friday’s market action and was quoted at $22.97 the ounce. The white metal has given up $2 in value over the past week, suggesting that spec funds had driven it to levels less than warranted under current conditions. Platinum was off by $11 at $1,663.00 and palladium shed $9 to open at $577.00 per troy ounce. Once again, no change to note in rhodium, quoted at $2,250.00 the ounce. Both noble metals narrowed their losses later in the session to but $3-$4 per ounce. Daimler AG CEO Dieter Zetsche said that his firm’s Chinese sales could grow by over ten percent next year. Such a gain would come on the heels of a twice-as-large bump in deliveries to the Chinese market that Daimler expects to tally for the current year. The German automaker is racing hard to catch up with BMW and Audi in the fast-growing luxury vehicle segment in China. In the background, oil futures gained ground and black gold was quoted at $81.57 per barrel (a rise of $1.07). Meanwhile, VW AG warned- without giving specifics- that (its sales?) growth might not continue “quite as strong’ in Q4. This, after reporting a surge in its nine-month profit tally. No such apprehensions were noted in the sentiment readings among German businesses being gauged by the Ifo think tank in Munich. The firm noted a rise in German business sentiment -the fifth in a row- to the highest level seen in 42 months. The emerging feeling among traders ahead of the end of this trading week points to somewhat of a ‘calming down’ and a sense of the markets having already factored in a November easing by the Fed. Also on display however, is an attitude that reflects a lack of certainty as to how much (or little) the Fed will offer, and what the timetable might look like, not to mention the still-open debate as to whether any such action will have any visible effects. Fuzzy as she goes; ‘tis the new ‘normal.’ That, and the added volatility we will have to contend with before that ‘epic’ first week of November, coming soon, to a market theatre near you. Good friend and respected analyst Mickey Fulp (a frequent contributor to the Kitco Commentary section) might have to contend with a raft of irate (a euphemism) e-mails for ‘daring’ to call the junior gold sector as ‘overvalued’ in his most recent interview with the folks over at The Gold Report. Mickey opines that: “With gold prices reaching record levels, equities and especially the junior explorers will tend to run up faster than even the price of gold. That's risk, and that's why careful due diligence of junior gold explorers is so important in order to pick undervalued companies with respect to their peers. If there is a pullback, the companies that are undervalued now should benefit at the expense of those that currently are overvalued.�? On the other hand, Mickey might not have to take as much “incoming�? from a certain class of reader as another metals market veteran –Ned Schmidt- might have to. Ned (who, by the way, feels that gold’s eventual target could be as high as a more than $1,700 level) cautions audiences that the final quarter of 2010 might witness an increased willingness on the part of momentum traders to let go of (some) their (highly) profitable gold positions since they are not essentially “fond�? of gold as much as the ‘man in the street’ might normally be. Not at all, in fact, as they treat the metal as an asset play. No loyalty. Ned calls gold as now being in a ‘bubble,’ exhibiting a ‘parabolic rise,’ and sees potential for a ‘pullback’ to levels as low as perhaps 30 to 50 percent away from current ones (i.e. a downside risk of $675). He does not recommend shorting the metal for the average investor, but does envision the establishment of a trading range for the yellow metal after the parabolic rise is undone. Three-to-five years from now, Ned feels, the long-term gold holders will be happy to have held on to their gold positions. The Sunshine Mint (a household name in the business of all things silver) has outdone itself with this one. This writer held one of these perfect-looking ingots the other day and experienced instant silver lust. 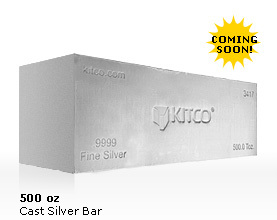 Not a cheap item, by any means, but definitely one that –when held- embodies the essence of physical ownership in the white metal and reinforces the powerful effects of the ‘fondle factor.’ A superb addition to the growing family of eponymous silver products currently being offered at Kitco.